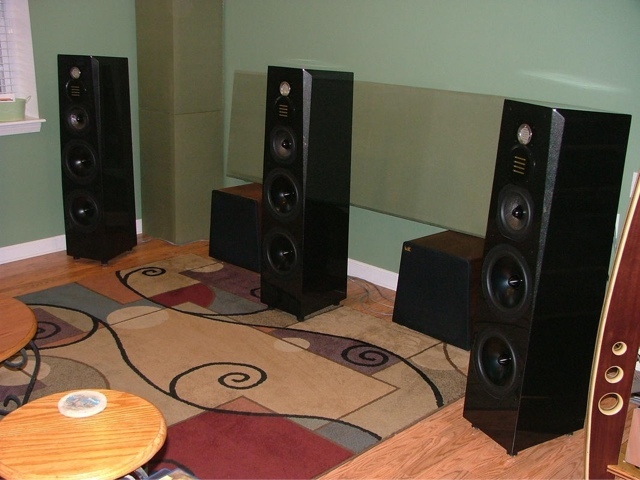 The other day I had a chance to visit a friend and listen to his Legacy Signature SE floor standing speakers. I would not call this a review, but just sharing a bit of my experience. 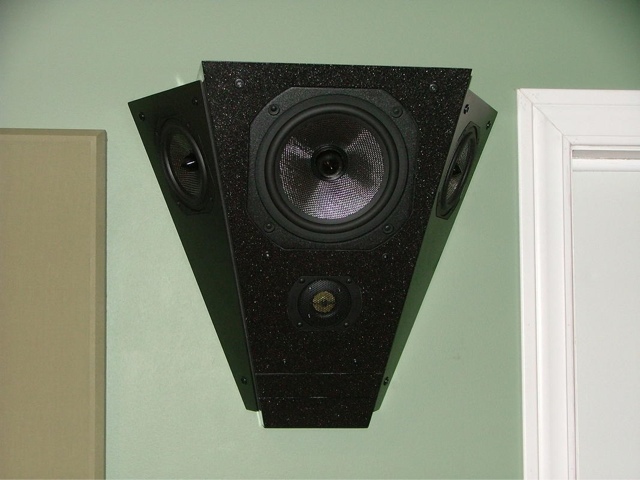 These particular speakers have some factory upgraded crossovers using Clarity capacitors. Having heard other Legacy speakers from the recent lines, I knew these would not disappoint. The top end driver configuration is similar to the Signature SE's big brother, The Focus SE (which a pair just happen to be in the same room) utilizing a pair of folded ribbon tweeters. A single 7" silver graphite driver for the midrange and the bottom end driven by a pair of sealed 10" drivers. These were setup as full range in a home theater configuration with 3 across the front and a pair of Legacy Phantom surrounds. A couple M&K subwoofers were also in the system, but they were turned down quite a bit. 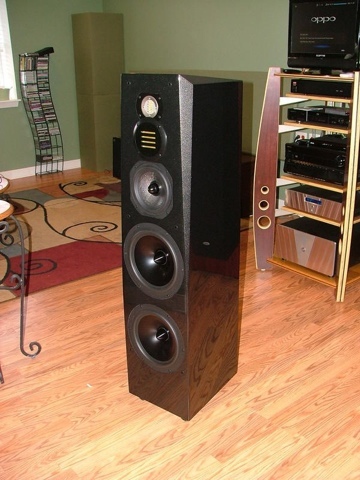 Simply level balanced with no EQ being used at all, these speakers sounded well balanced. I attribute this to the way these speakers are "voiced" from the factory. Bill Dudleston, President of Legacy, puts a lot of effort in tuning the speakers for typical room environments, so natively out of the box they can already sound good. Some minimal use of EQ should dial in the frequency response to perfection. Of particular note is the smoothness of the vocal range. Just like their big brother, they convey an effortless reproduction of vocals. Legacy has made me a fan of ribbon tweeters, which is where I suspect some of this smoothness formula comes from. The high end was perhaps a touch hot but only noticeable on a couple of recordings we heard. The bass range was well defined and tight but didn't have the same depth as the Focus SE. Any home theater system will utilize a separate subwoofer, so deep bass is a non-issue here. We rolled through a variety of SACDs and Bluray discs during the late evening. It was a pleasure to listen to about anything. I'm sure on my next visit these will be further dialed in using an Audyssey EQ system. I can't wait for that! If anyone in the South Central Pennsylvania area would like to learn more about Legacy speakers, drop me an email and I can point you in the right direction. My visit to the Basspig's Lair! One guy's audio system has had my attention for a number of years, His name is Mark Weiss, AKA Basspig. See his website at Basspig.com I've enjoyed discussions with Mark for probably over 8 years now and I've always wanted to make a trip to Connecticut to hear his audio system, but never seemed to find the time. Mark decided last month to have a get together for like minded enthusiasts called B.A.S.S. - the Basspig Audiophile Society Social. I checked my calendar and thought to myself, I'm going to go! I had an enjoyable 5 hour drive to Connecticut. I occupied my time with listening to the radio, podcasts and testing out my new dual band 2-meter/440Mhz Amateur radio. (Kenwood D710). Upon arrival I was greeted by Mark and some other audiophiles from the Carver Audio forum. (My apologies, as I am terrible with names). After some quick introductions we got right down to business. Mark has assembled a nice basement electronics test bench and had some interesting things to show us. One of which was a multistage op-amp circuit on a breadboard which he was feeding a sine wave and measuring the distortion at the output. The coupling capacitors were of the ceramic disc type and showed moderate distortion via a spectrum analyzer, yet a fairly healthy looking sine wave on an oscilloscope. Swapping in some polypropylene capacitors dropped the distortion to almost undetectable levels! He has a nice YouTube video of this demonstration which you can view HERE. We also saw several SET tube amplifier demos and Mark demonstrated his newly acquired Tektronix Curve Tracer. This device shows how a tube operates dynamically throughout a range of stepped grid voltages and shows the voltage-current relationships, ect. It also works well for semiconductors such as transistors and diodes to give a complete picture of the devices characteristics. While all the electronic demos were fun what I was really here for was to hear Mark's sound system. Designed, assembled & upgraded for decades, by the Basspig himself. Upon entering the room that I've look at countless times in the Internet, I immediately noticed one thing. His basement theater & studio looked small. Things really do look bigger on TV! After a brief overview of his rack equipment we sat down to enjoy some AV bliss. First up was some video Mark shot downtown to demonstrate that the differences between 480p and 1080p video are not also so apparent. While the 480p looked good (probably due to the high quality signal chain Mark uses) the jaggies and aliasing were quite evident. The 1080p video had little, but some observed artifacts. At some point Kal Rubinson, a contributing editor at Stereophile magazine stopped in to join the party. We then watched some NICE sharp video Mark shot of some his wife, Mary Ann's Geisha doll collection. The close up textures of the doll's clothes were very detailed and the smoothness of the porcelin faces looked flawless. A sample can be viewed HERE. Onward to some of Mark's recordings of Saint-saëns Cello Concerto he shot in Boston. What can I say, when a recording has such superb video and sound you tend to get lost in the content. Mesmerized by the beautiful soloist everyone was amazed by her talent and the punishment her cello was put through. All this with rather mild volume levels, was quite enjoyable. Sometime during the presentation, Ethan Winer (Owner of RealTraps) and his wife Elli joined us. His new book, The Audio Expert, will be released in about 2 weeks, and there are reference's to Mark's system in the book, so look for it on Amazon. The next demo was Mark's near field recordings of a Zambelli fireworks show. This is the closest reproduction I've experienced compared to the real thing. It might even have been better! The dynamic range had a wide aperture (>85db) From the crickets in the field and the children's laughter in the distance to the 8" shells popping overhead so tight and defined without a hint of straining. One guest had to hold on to his hat because it was literally trying to dislodge itself from his head! The transients were that strong. This sound system is akin to a giant lung, pulsing air very quickly to reproduce the explosions being shown in full HD video which by the way was equally as beautiful, showcasing his DLP projector's contrast ratio to display the dark sky and flashes of color from the explosions. A sample compilation can be seen HERE, but I assure you it won't be the same experience as the uncompressed Bluray via the Basspig's rig! After a few more electronics lab experiments we convened in the kitchen for some of Mark's now famous artisan cheese lasagna and a little wine. Some of the neighbors were setting off firecrackers in response to our playback session, apparently thinking we were doing the same! After some friendly group conversation over a great meal, I ended up as Mark's last guest. We returned downstairs where we reviewed some things in his lab and moved on to some more audio demos. Mark demonstrated Carver's sonic holography, a feature of the Carver C-4000 preamp. Using only 2 channels it really does put images WAY out to the left and right. I had to verify the material really was 2 channel and that his side surrounds were indeed off. It was very convincing, but limited to about a 2 1/2 ft wide sweet spot. If one moves to the left or right too far, the illusion disappears. We also played around with a subharmonic synthesizer, which can restore some of the fundamentals in poorly recorded music. I have one in my rack as well, but I have not really used it. I wish i could have had more time to demo some things I brought with me, but Mark kept pulling out some great material and I was more than happy to absorb the experience. Next Mark really put the pedal to the metal and turned the volume up to Basspig levels. Its a shame everyone else didn't get to experience this elevated level. I can't remember the exact songs he played. It could have been the pop Asian songs from his vast collection or the Isley Brother's remake of Summer Breeze. But the pressurization of the room was unbelievable! Any article of clothing that is the tiniest bit loose was subject to the undulation by the low frequency wavefront. To my surprise this even included my scalp, as it seemingly floated on the top of my skull, moved by my hair as it became an acoustic sail captured in the massive invisible tide of infrasonics. I know, it's a mouthful of to read but it's difficult to capture the experience in words. Yet despite all this high SPL, the sound is not fatiguing and doesn't make one wince in pain. This my friends is the hallmark of a sound system with LOTS of overhead and very low distortion. We played around with some MIDI stuff later on, which I only really have a concept of. By now it was getting late so we decided to break for some coffee, which I had roasted the day before and some home made rum cake which I brought along. After more great conversation, it was almost 1am and I had a long 5 hour drive home. I could have spent days on end talking to Mark about audio, electronics, politics, birds, ect. He's a good guy and has a tolerant wife to put up with his audio "machine" downstairs. After 24hrs, 500+ miles and probably 140dB, I was very glad to be home in my bed!